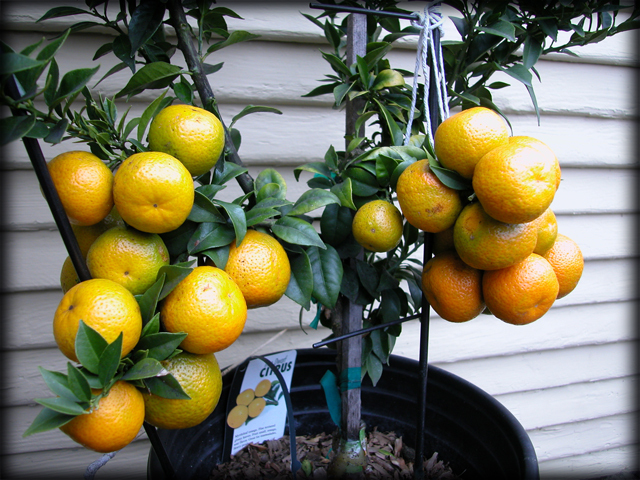 My little calamondin tree (previously) has been doing quite well and produced a nice sized crop of fruit this summer. When I went to water it a few days ago I realized most all of the fruit was ready to harvest. The question was what to do with it? With the winter harvest, I focused on muddling the fruit and created both a bourbon and a rum cocktail which were pretty decent. This time, however I had a lot more fruit than I thought could be reasonably used before going bad. So, I decided to preserve them by making a marmalade. 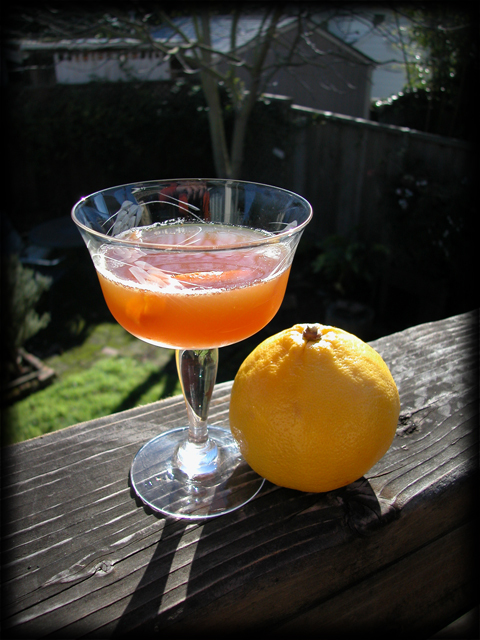 I based the recipe below on one for kumquats by Matty Eggleston from Left Coast Libations. Makes approximately 1 pint of marmalade. 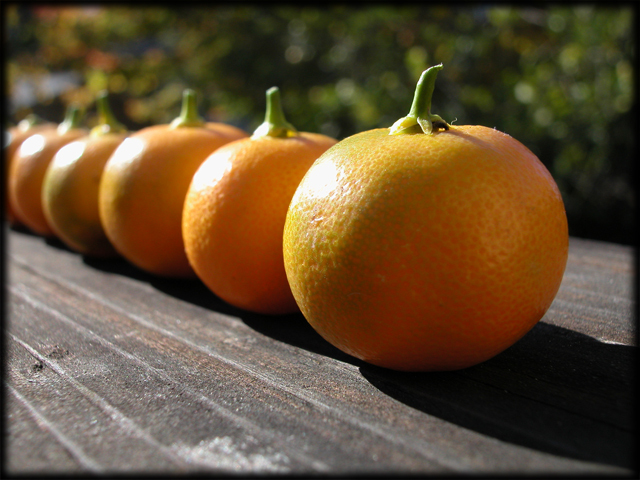 – Trim the very top off each calamondin and then slice in half across the “equator” of each fruit. – Remove any seeds using the tip of the knife. – Coarsely chop the cut and seeded calamondin in a food processor using “pulses” to prevent pureeing. 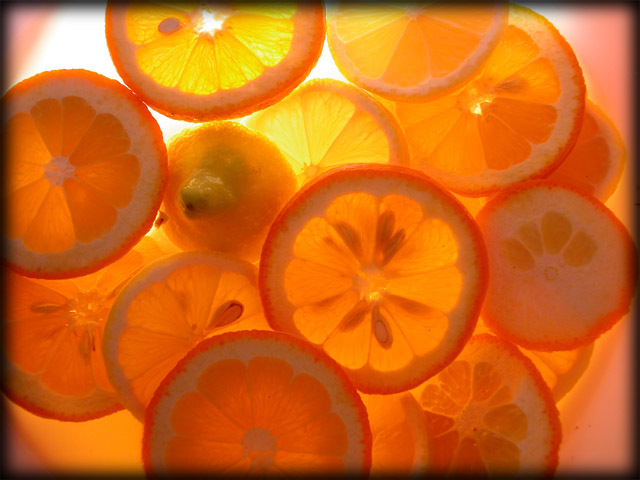 – Put the chopped calamondin into a medium sauce pan along with the sugar and the water. 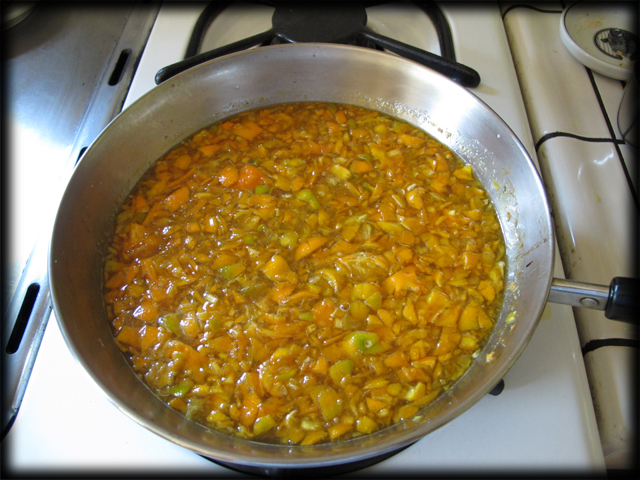 – Bring the mixture to a simmer while stirring to dissolve the sugar. – Continue stirring, removing any seeds which may have been missed. – Heat the mixture for approximately 10 to 15 minutes or until it thickens, darkens, and most of the peel becomes translucent. – Stir and adjust the heat as necessary to prevent boiling. – Turn of the heat and remove the sauce pan from the burner. 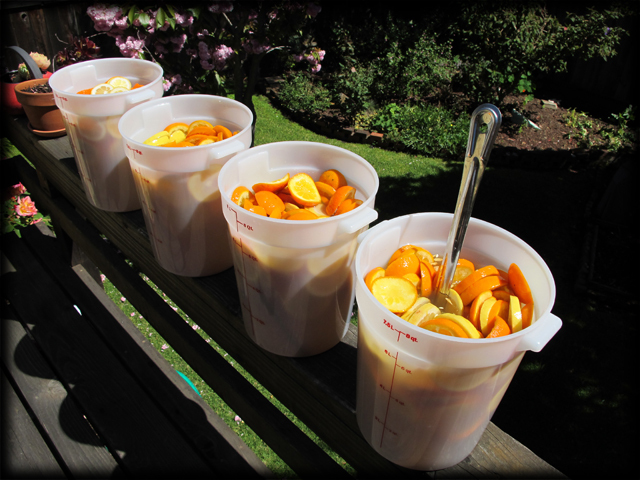 – After the marmalade is cooled, put into an airtight container and store in the fridge. I must say it came out fiendishly good! I mean like ‘eat it by the spoonful’ good. It’s also not too firm, a characteristic which would have made it difficult to mix with. I was also very happy with the couple of cocktails I made using it. Nothing ground breaking, just sturdy deliciousness. 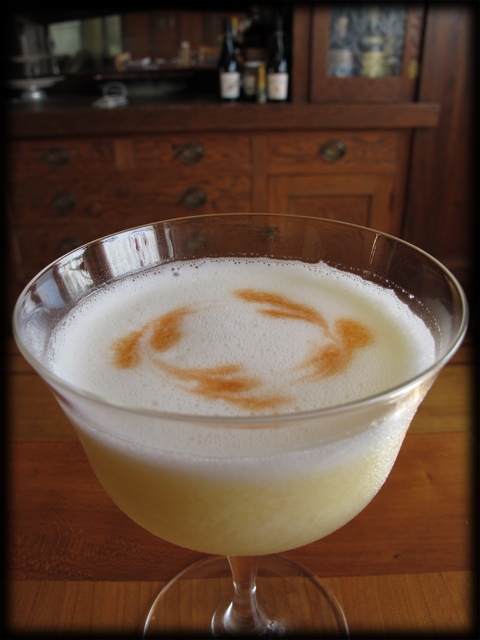 My favorite was the pisco sour and everyone who tried it thought so too. 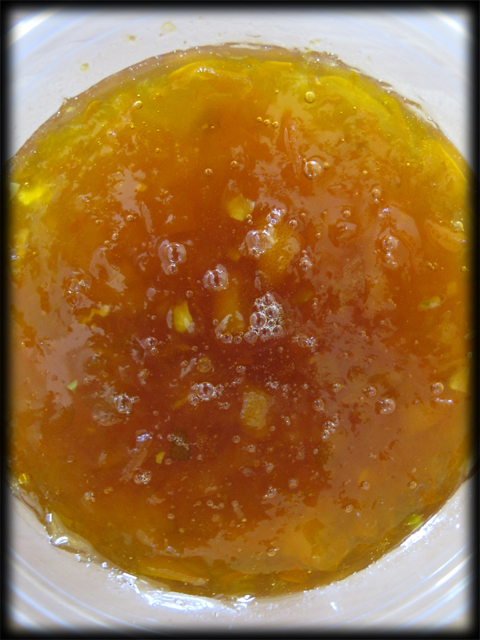 The smokiness of the pisco made a create completement to the rindy-tarness of the marmalade. Combine all the ingredients in a mixing glass. Shake hard, without ice, to froth the egg whites. Add ice and shake 10 more times to chill. Put a few drops of Angostura bitters in the froth and make a pretty design using a toothpick. 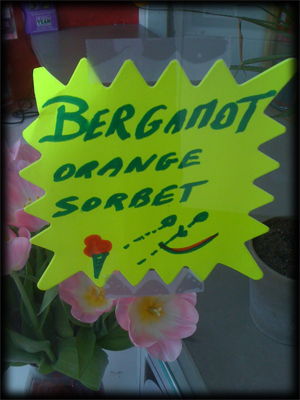 Any other Bergamot sightings to share? 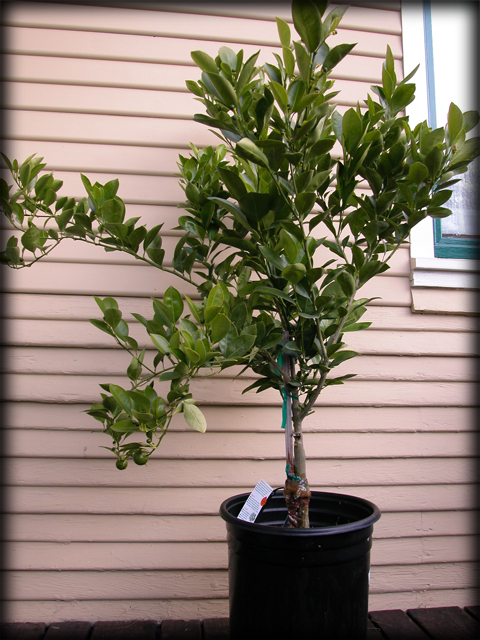 So last winter I got very jazzed about exotic citrus varieties, especially all of the various mandarin/kumquat crosses. Their size seemed to make them perfect for muddling in a cocktail glass, capturing both the juice and the aromatic oils from the rinds. It turns out there are dozens of these hybrids, many of which originated in China. The only one I could find for sale, however, was the mandarinquat, which looks like a rather oversized kumquat but which is a bit sweeter. I made several very decent gin cocktails using these, mostly based on the template provide by Jimmy Patrick’s Madagascar Orchid. The hybrid which I really wanted to find was the kalamansi which is sometimes called a Philippine lime because of its popularity in that country. However, despite bay area’s large Filipino population, I could not find these for sale in any of the many asian markets in Oakland and San Francisco. Possibly it was “out of season” though it seems to be one of those citrus varieties which bear and ripen fruit all year long. 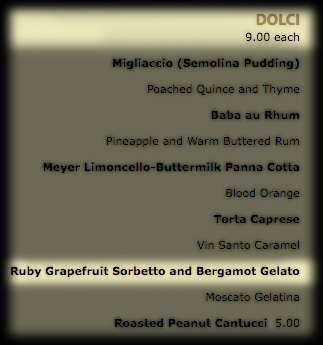 It also occurred to me that California might simply impose some kind of embargo on this fruit for agricultural reasons. The closest I came was a frozen kalamansi concentrate whose first ingredient was corn syrup. Fail. 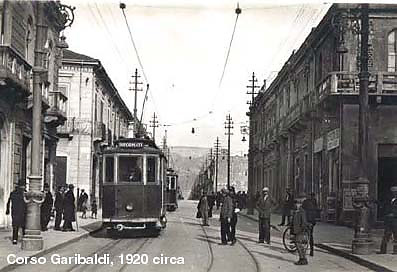 I also started looking for it under the other names it apparently sometimes goes by: calamondin or kalamondin. 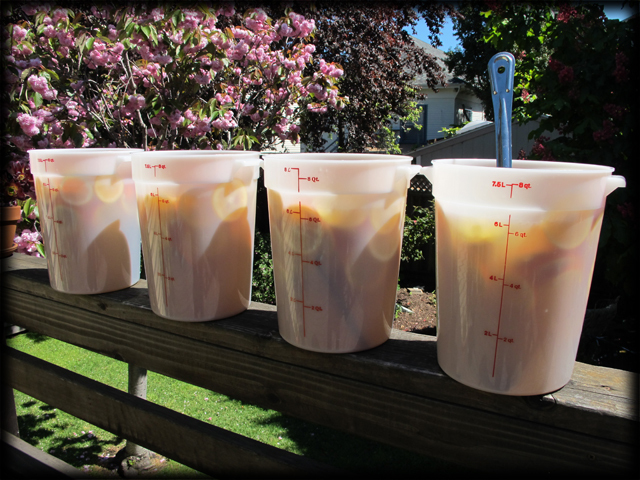 In late spring I had a sudden brainstorm and headed down to a large local plant nursery. 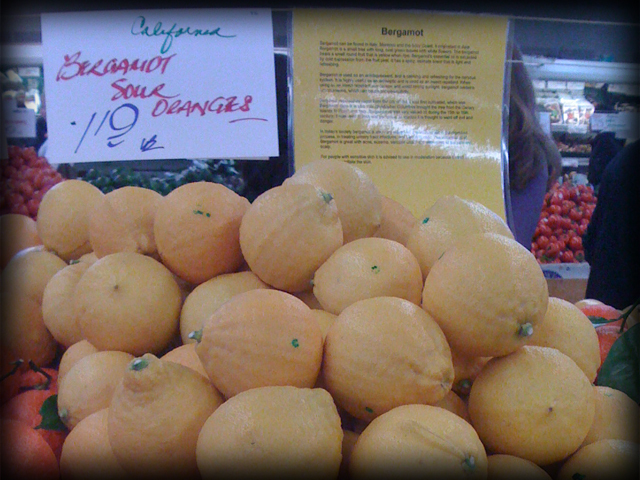 They had a large selection of dwarf citrus and there, among the conventional lemons, oranges, and grapefruit, I found a calamondin. It didn’t have any fruit on it yet but it was early enough in the season that I figured there was a good chance it would come into bloom. After some travails with chlorosis (leaves turning yellow) and an application of a proper fertilizer, my little calamondin bloomed and proceeded to set a couple dozen fruit. So, while I am now enjoying fresh calamondin in my cocktails, I am still on the hunt for fresh kalamansi. Maybe this year? Put the calamondins, the bitters and the Navan in a mixing glass. 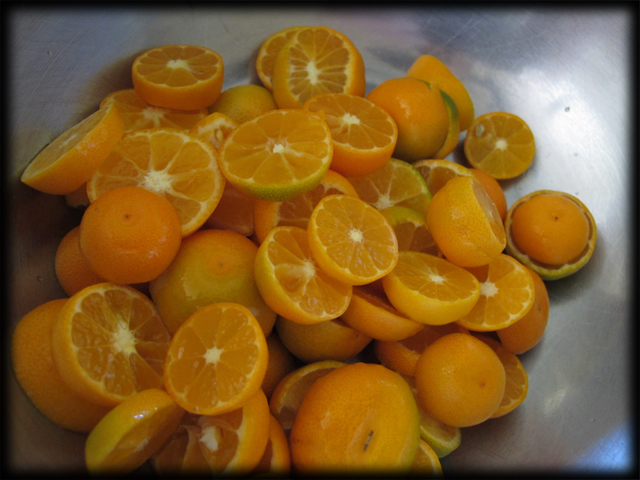 Muddle firmly, pressing the calamondins to extract all the juice from each segment. Add the bourbon and the agave nectar. Shake hard with cracked ice. 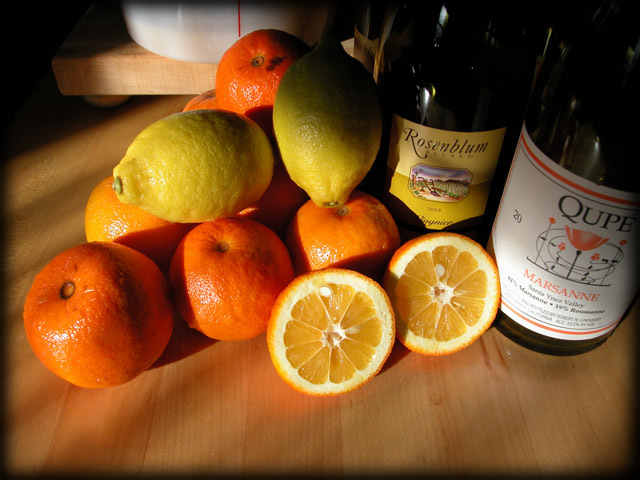 NOTES: Try with a few drops of chili tincture for a lovely contrast against the sweet/tart calamondin. 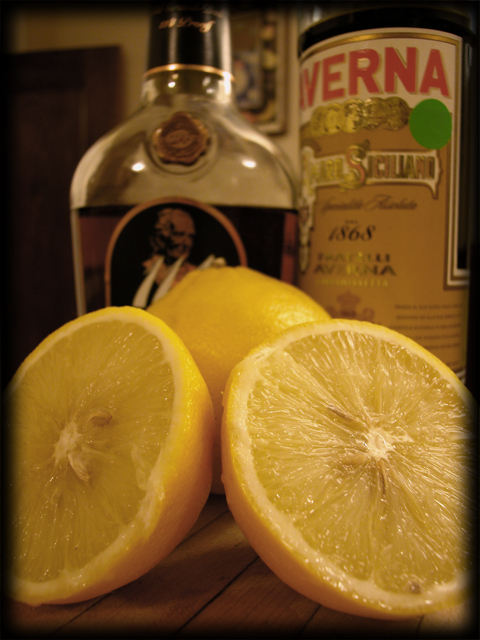 Put the calamondins, the bitters, the dram and the simple syrup in a mixing glass. Add the rum and the Lillet Blanc.